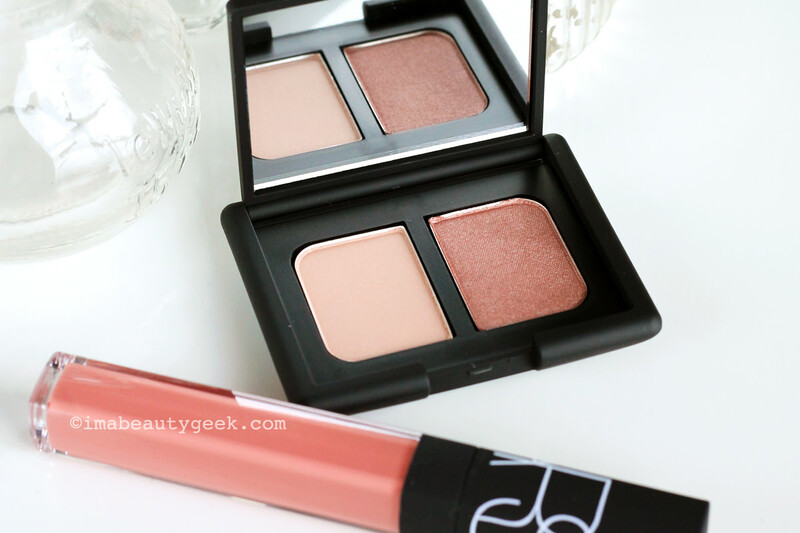 I couldn&apos;t resist this pretty, limited-edition Hammamet Duo Eyeshadow from the new NARS Spring 2016 Nouvelle Vogue collection of makeup. I&apos;m already using it... and I rarely wear eye shadow. The combination of matte beige and rosy bronze is so Spring, and a lovely option if you&apos;re trying to get away from dark eye makeup. All you need for a fast fresh finished look is lots of black mascara. A flick of deep bronze or chocolate brown liquid liner works, too. Or black liquid liner, of course. 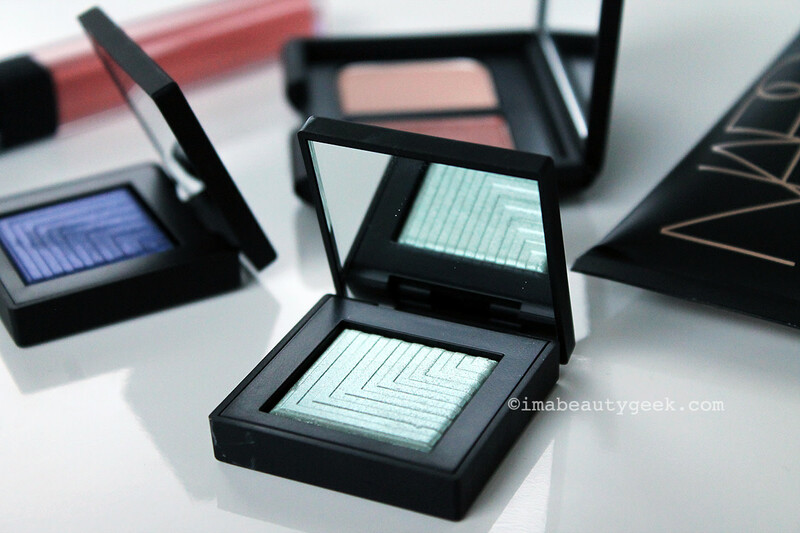 Hey, let&apos;s look at the rest of the new NARS Spring makeup, shall we? 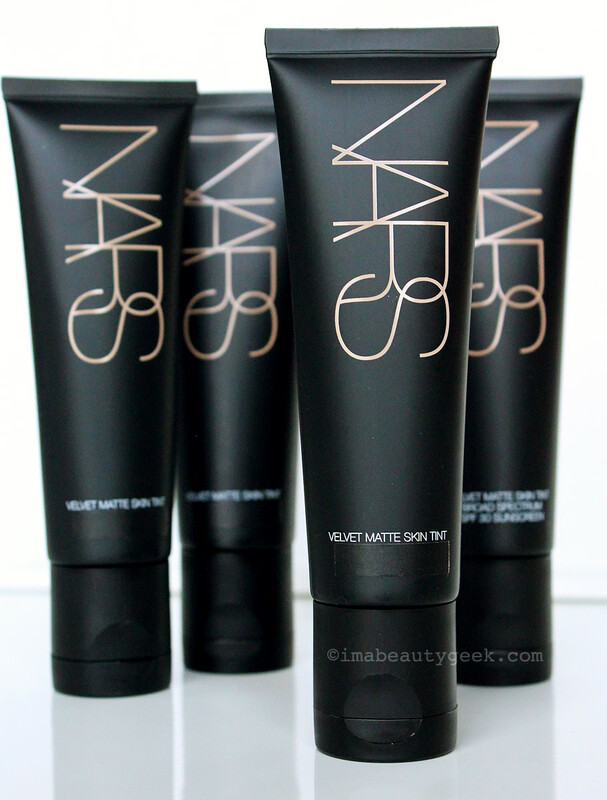 Also debuting this Spring, the new oil-free NARS Velvet Matte Skin Tint comes in 12 sheer-to-medium shades; I have four to show you. In the image below, from lightest to deepest is Terre Neuve Light 0, Finland Light 1, Groenland Light 3 and Malaga Med/Dark 1. 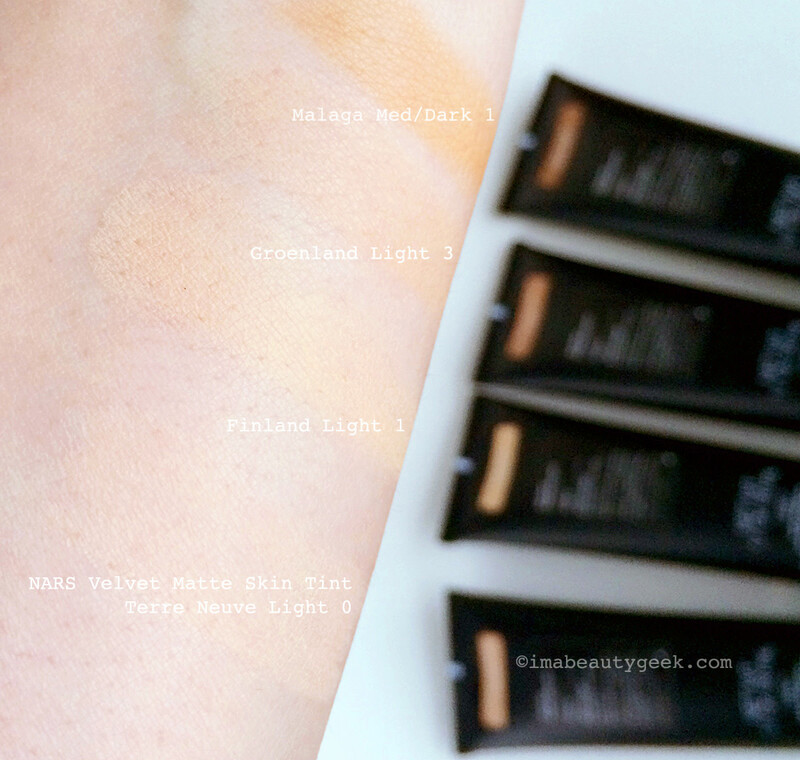 The NARS Velvet Matte Skin Tint texture is cushion-y and light. 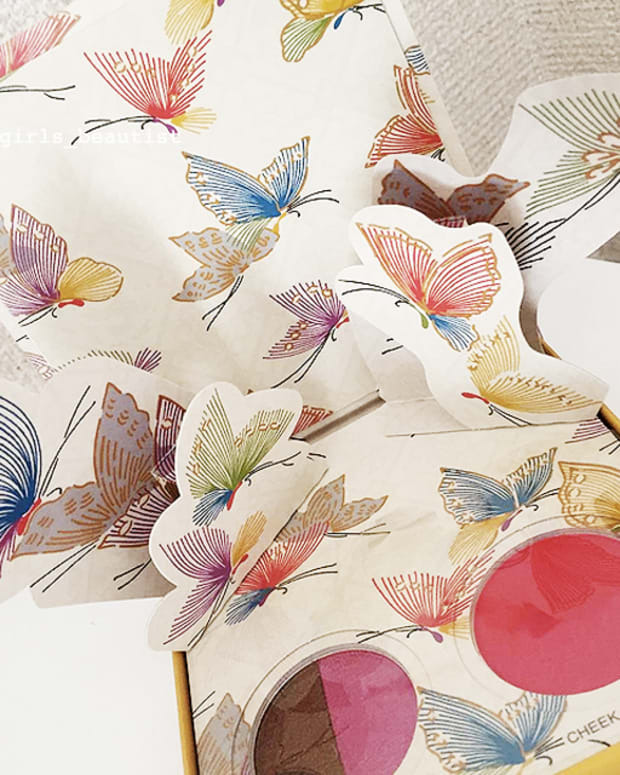 Spherical pigments with opaque centres that become more transparent toward the exterior refract light to create an natural, non-chalky effect similar to blur formulas (without that silicone-sheet feeling). Rose fruit extract (aka rose hip) provides antioxidant benefits with its high concentration of Vitamin C; the formula also contains Vitamin E. It offers broad spectrum SPF 30, even though the brand can&apos;t say so on the label in Canada. 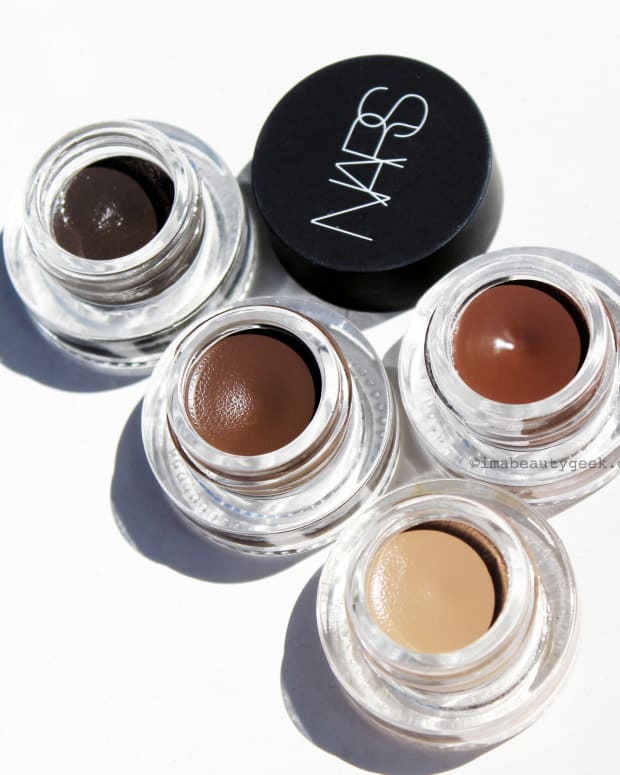 Before we see which shades actress Malin Akerman wore at the Golden Globes, please enjoy this quick slideshow of the full NARS Spring 2016 Nouvelle Vogue colour collection, as well as a shade chart for the new NARS Velvet Matte Skin Tints. As I mentioned earlier, celebrity makeup artist Kathy Jeung used some of the NARS Spring 2016 makeup on Canadian actress Malin Akerman for the 2016 Golden Globes. On her skin, Malin is wearing the new NARS Velvet Matte Skin Tint ($54 CAN at sephora.ca Feb 1st and $44 US at narscosmetics.com) in St. Moritz medium 1. On her eyes, the rosy pink eye shadow she&apos;s wearing is NARS Dual Intensity Eyeshadow in Kari ($38 CAN at sephora.ca Feb 1st and $29 US at narscosmetics.com). 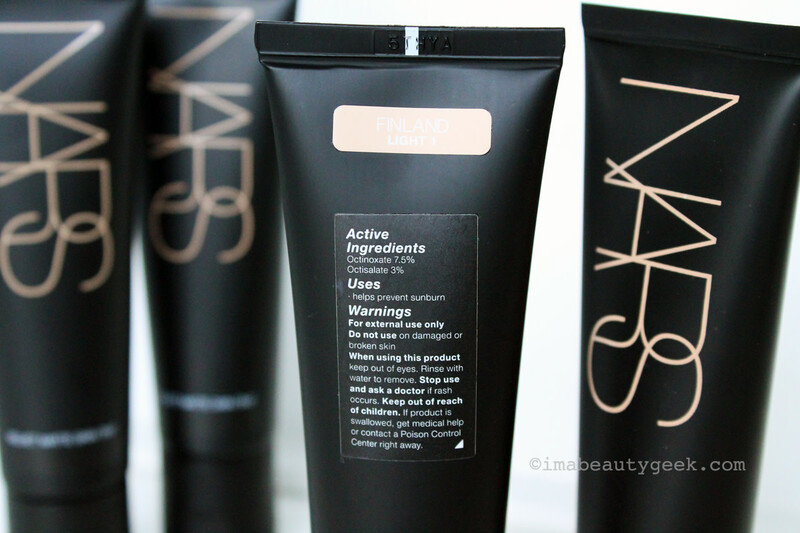 Pardon me, but have you seen the NARS Hot Sand collection at nordstrom.com? It&apos;s so gorgeous and light and not winter, yet it isn&apos;t really all tropical vacation either. 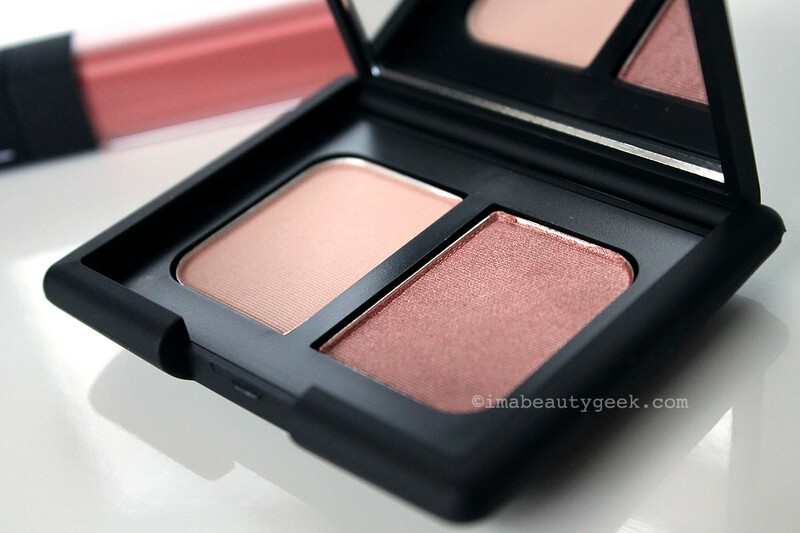 Fresh and radiant like a new complexion, the blush and bronzer duos are existing shades matched with a lovely illuminator hue – Hot Sand – that also comes on its own in a creamy NARS The Multiple stick. I&apos;ve got #grabbyhands. 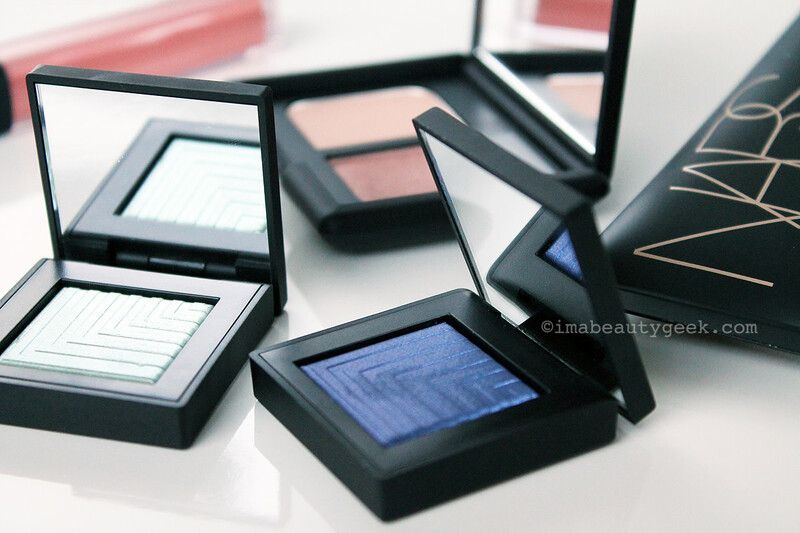 Anyway, back to the official NARS Spring 2016 releases. They&apos;re already available in the USA via narscosmetics.com; they land on Canadian counters February 1st. Does anything catch your attention? Am I the only one who keeps calling it the "Nouvelle Vague" collection by mistake? US lovelies, have you already acquired any of these items, maybe tried them?